It may have accidentally been let slip that hip hop legend Eminem is preparing for a major comeback. The rapper has been on the music scene for years but his success sky-rocketed in 1999 following the release of his triple-platinum debut album The Slim Shady LP. While it feels like it has been forever (2014) since Em has been out of the limelight, it was accidentally revealed a new album could be well on its way. Allen Hughes, who was the director of a HBO documentary on Dr. Dre and Jimmy Iovine, called The Defiant Ones has all but confirmed it. Dre still records. People don’t know this, Dre records every day. Literally, he’s in there recording songs every day. He’s like Picasso in that way. He’s always painting. Right now he’s producing, in the 11th hour, a track for Eminem’s latest album. So Dre’s still real active in music, you know? But I hear what you’re saying. It’s the truth. 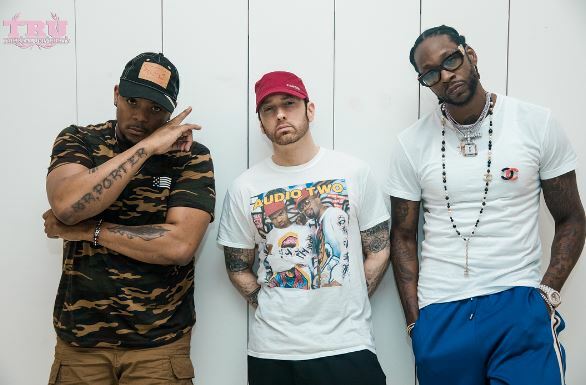 Allen’s comments have only added fuel to the fire, fellow rapper, 2 Chainz, got people talking a few weeks ago, by posting a series of photos of him and Eminem on his Instagram account. Sooo this jus happened ……#marshalllikestrapmusic ??? Don’t know about you, but this has got us pretty excited.